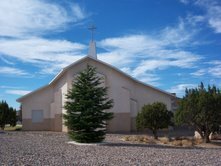 Presbyterian mission activity in Southern Utah had its early beginnings in 1880 when W.C. Cort was sent from the Presbyterian Theological Seminary in Chicago to establish a school in Parowan. The School was conducted by women missionaries and proved to be quite popular to Protestants and Mormons alike because of the high quality of education taught. A school was also started in Cedar City but was not as popular because of the stronger Mormon opposition. The Rev. Clayton S. Rice came to Cedar City in 1913 and served the Presbyterian and other Protestant congregations from Milford to St. George from 1914 to 1918. He and Dr. Green were primarily responsible for raising the necessary funds for building the new church in Parowan under the direction of the Presbyterian Board of Missions. The bell, which had been at the mission school and was used to call children to classes, was placed in the tower of the new church. The bell was originally among many others cast for installation on steam locomotives for railroad trains in the eastern states. When that railroad was sold, an enterprising young employee opted that the bells should all be removed from the locomotive engines and donated to the numerous churches being built along the western frontier. In later years, as mining and other industries developed in Cedar City the center of Presbyterian activities moved south from Parowan. The Rev. Elmer Geiser arrived in Cedar City in early 1925 and led church services in the basement of the Carnegie Public Library. Rev. Geiser, along with Charles Lundgren and Oscar Larson encouraged the congregation to contribute to the construction of a new church building. Construction was started in August of 1925 and the new facility, located at the corner of 200 North and 100 East, was dedicated to the worship of God on May 26, 1926. Through the years it was a struggle to maintain the building and keep an active congregation. The church was supported by missions of the Presbytery until the 1980's when the congregation became self sufficient. The Rev. John McCandless was called to be the Pastor of the church in 1983 and during his tenure membership and Sunday School programs increased to the point the when he retired from the ministry in 1992, there was a definite need for a larger facility. During the interim ministry of Rev. Ed Kicklighter, interest was further aroused in studying the viability of enlarging our worship space. Several options were presented to the congregation over the next several years and under the direction of the Rev. C. Jeffery Garrison, who became pastor of Community Presbyterian Church in November of 1993, a positive increase in programs, outreach, and attendance was nurtured. Construction of the new 15,000 square foot worship facility began in August of 1996 and was completed in December of 1997. On moving day, December 7, 1997, the opening portion of the worship service was held in the old church sanctuary and the remainder of the service was held in the new church sanctuary located at 2279 North Wedgewood ln in Fiddler's Canyon. A stainless Steel Celtic Cross now adorns the roof of the sanctuary and the bell which had been from the church in Parowan and rang out from the tower of the old church for over 70 years is now in the tower of the new church where it continues to ring out, calling people to worship each Sunday morning. Our active membership is about 140, and thanks to the generosity of these and some who have gone before, we are enjoying a beautiful, fully paid for worship, educational, fellowship and administrative offices facility.